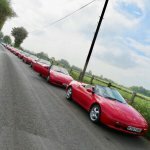 I've looking for an Elan M100 for a number of months now and must admit to seeing some dogs. I've now got to try and stop myself from upgrading - probably a lost cause. Brake/master cylinder upgrade, re-chip, sports exhaust, etc, etc. I hope to get the seats out over the winter and treat/recolour the leather, if I can find some information on it. Cor, that looks like a nice one! Worth the wait I presume. That looks like a rather nice exhaust already. Getting the seats out is pretty easy (especially if you do it with the roof off). Best to put some copper grease on the bolts while they're out, and watch out for the odd-sized spacer. Graaf - excellent choice! Looks just like mine...... 513 what's your number??? Nottingham just round the corner from me too!! Number 637. Last seen for sale in 2010 with 48k miles. - what details do you need?? Don't you mean 10p per mile ? You can PM Geoff these details. That does look like a very nice example. Enjoy it. Congratulation! This one is really nice. JMP wrote: Congratulation! This one is really nice. I've got the re-spaced plate in the boot but not sure if I dare use it! very decent looking one indeed! !